Tavern Gardoš is located at Grobljanska Street at Gardoš (Zemun) and for the third season in a road represents synonym for real bohemian entertainment. This remarkable location provides its guests beautiful view and garden. In over 200 square meters you can enjoy in oasis away from daily city rush. Here you can enjoy and spend most intimate and romantic moments that you will cherish whole your life along with beautiful view of Belgrade, Danube and Zemun. 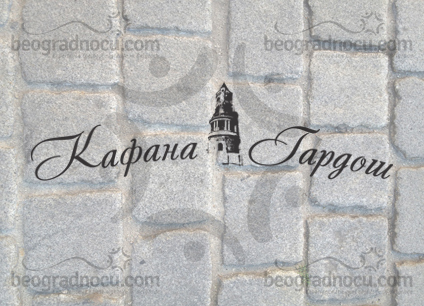 Staff of tavern Gardoš will make sure that with pleasant and friendly service you love this place at first visit. Besides, standard service which is on high level in tavern Gardoš, this place is suitable for organizing different kind of celebrations, presentations and cocktails. Tavern Gardoš offers very delicious dishes for all your special occasions and as well as wide selection of drinks at very affordable prices. There are also great promotions: Vodka 0.7 and 4 Red Bull for 6500 rsd, Johnnie Walker 0.7 and 4 Red Bull for 6500, and Jack Daniels 0.7 and 4 Red Bull for 8500 rsd. Every Friday and Saturday you can expect enjoyment in live band performances. Friday is reserved for Gardoš Bend while Saturday is reserved for true bohemians and lovers of traditional music, when you can enjoy in live performance of Miroslav Ilić. On Fridays and Saturdays music starts at 11 pm. From week to week tavern Gardoš is offering you amazing entertainment - come and see for yourself. Do not miss to visit this tavern during a day a take a break from daily capitals' rush and enjoy in delicious meals, or come to fabulous party on weekends. This is one of rare places where you can party until 5 am in the morning.